The Gnarwhal Gear tarp shelter is a hex-style tarp featuring 210T ripstop polyester with a PU coating. The ridgeline is 12 feet (3.6 m) long and is fully taped. The tarp is wide with 4.5 foot (1.4 m) side panels. Interestingly, the side panels are different shades os grey. A large Gnarwhal logo is printed on each side in a corer. Each edge has a catenary cut and is hemmed with ribbon. Each tie-out is reinforced and has ribbon loops plus a metal grommet and a line lock. In addition, each tie-out point has a hook-and-loop capture to hod the guyline when not in use. The tarp comes complete with guyline on each tie-out point, aluminum stakes, a continuous ridgeline, two large aluminum wiregate carabiners, and an extra ridgeline for more complex set-ups. The tarp size is perfect for hammock camping, and the extra lengths on the side panels allow this tarp to pitch lower for a storm mode that offers more protection while still allowing for more headroom. Line locks make pitching a little faster than tying knots, but I’ve noticed that too much tension (especially on the ridgeline) can make the locks slip. The manufacturing is typical for a mass-produced item in terms of fabric and accessories, although the stitching and finishing is a little better than most. The seams are straight with no loose threads, and the seam taping is remarkably straight. The fabric is inexpensive, but the design is well thought out. The Gnarwhal Gear doesn’t make any excuses about its construction or material, and I appreciate the honesty behind that. Some gear makers take advantage of overseas manufacturing and then exaggerate the pricing. 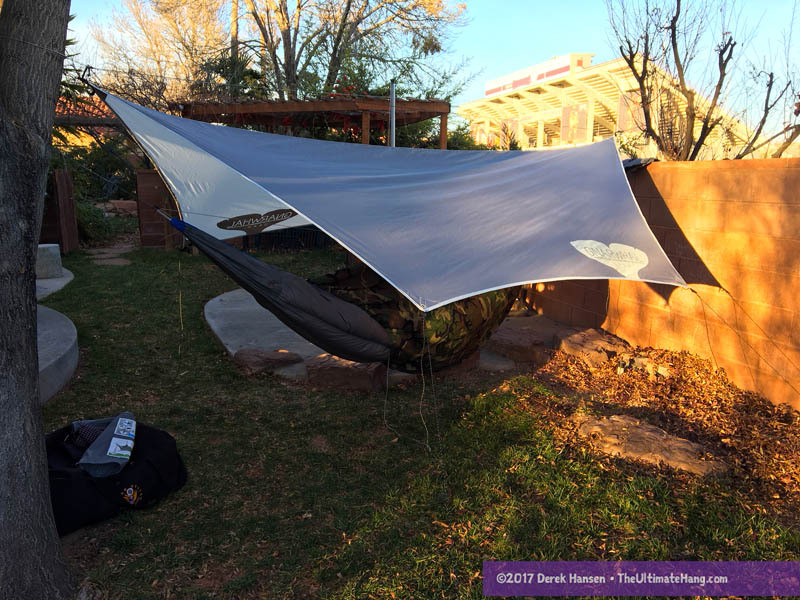 I don’t often compare gear head-to-head, but I think it’s worth mentioning that the Gnarwhal Gear tarp is among the most cost-effective option for a hammock tarp, rivaling the Kelty Noah tarp that is often promoted as a low-cost hammock shelter. The Gnarwhal, in contrast to the Noah tarp is purpose-made for a hammock and comes complete with all necessary accessories. For its size, the tarp packs down reasonably and is a good weight. I think it makes a great option for beginners, occasional campers, Scouters, or anyone looking for a value-priced shelter. I also find it interesting that the Gnarwhal Gear tarp features a continuous ridgeline set-up using a two carabiner method that I first developed back in 2012. The carabiners that Gnarwhal uses are extremely large for their purpose. Smaller keychain ‘biners would be more appropriate, but the large ones work okay. The set-up is a bit different than I recommend, but involves starting with the line connected to one line lock, wrapping the line around the anchor point and back through the carabiner and back to the opposite side, through the other carabiner, and then clipping the ridgeline rope to one end on the other carabiner. Suspension and Anchor System ♥ ♥ ♥ ♥ ○ The included line and stakes make this a nice package. The line can feel a little stiff, but includes reflective tracers. Aesthetics ♥ ♥ ♥ ○ ○ The tarp features a basic, two-tone grey fabric. The large logo is too flashy for my taste. Just curious what setup you would recommend for a continuous ridgeline. You said the gnarwhal is a little different than your preference, but didn’t state what you normally recommend. The basic continuous ridgeline figure-eight format they use is what I prefer, but their choice of hardware and connections are a little clunky for me. I love Loop Aliens and toggles.